In 1965 a local Vancouver band emerged calling themselves The Wee Beasties. 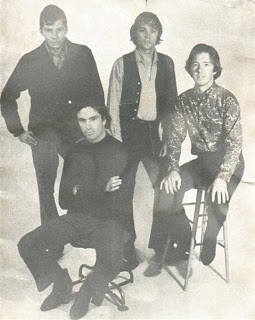 Co-founder, William “Bill” Hay told It’s Psychedelic Baby Mag in 2011 about how the band began. “I met Rob Rowden at the University of British Columbia. I was writing a lot of poetry, mostly bad, at the time. Rob was playing in a commercial R&B band. We became friends over the period of a few months and I told him that I was thinking of starting a band. We talked about it ;I warned him that it would be unlike anything that he’d done previously.” Bill Hay got the name The Wee Beasties from 17th century scientist, Van Leeuwenhoek, who looked through a microscope at one drop of water and found it teeming with microscopic life. Leeuwenhoek called the microscopic life – microbes – the “wee beasties.” However, the band changed their name before they began performing. The new name was The Painted Ship. Bill Hay was a poet and liked Samuel Taylor Coleridge’s “Rhyme Of The Ancient Mariner”. In Coleridge’s poem was the line from the twenty-eighth verse “… as idle as a painted ship upon a painted ocean.” Bill Hay was drawn to it. The “Ship,” as they were called for short, were comprised of Robert “Rob” Rowden on guitar, William “Bill” Hay on vocals, Barry Rowden on drums and Ken Wain on keyboards. Bill Hay had played in a youth orchestra for six years during his teen years. The Painted Ship was making original songs with a garage band, psychedelic sound. However, Vancouver was used to local bands in the mid-60’s mostly playing R&B covers. So a lot of record companies weren’t interested in recording the band. The lyrical content of some of the songs they wanted to record were also not geared to Top 40 AM radio. For example, “Little White Lies” was a song about the lies people are told in relationships. Finally, they met Robin Spurgin who let them record whatever they wanted at his small Vancouver Recording Studio. 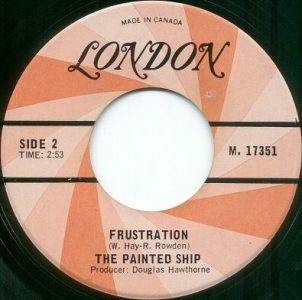 The Painted Ship’s first single release was “Frustration”. The Painted Ship supported the single with appearances at The Retinal Circus at 1024 Davie Street, near Burrard Street, on 31 December 1966, headlined by The Collectors. They also got airplay on both C-FUN and CKLG. and everything is troubling me. Can’t seem to find a place to turn. Can’t seem to find any place to go. Once in awhile I meet a few people. they try to give me some advice. On maybe, how to act. On maybe, how to walk. On maybe, how to talk. They think they know where it’s at. she looks so fine, I make my bid. the girl has to tell me how I should act. Oh Lord. Oh no. I can’t stand no more. In the songs’ lyrics there are people who want to give advice on how to walk, act and talk. On an alternate recording of the song The Painted Ship’s “The Captain” Bill Hay sang at the end of the first verse that the advice-giving people think that “they can make a better man, they think they always can show me maybe how it’s done.” At the end of the second verse Hay sings in the alternate version that the girls also tell him how he should dress. While the advice-giving people in the first verse might be the older generation, the second verse of advice-giving is coming at the narrator from girl(s) he tries to flirt with and/or date. AllMusic.com’s Stansfield Montfichet said that The Painted Ships’ “Frustration” seethes with primal angst. Its structure recalls the Castaways’ “Liar Liar,” with organ runs from Uzbekhistanm — or the Hindu Kush.” A reviewer with CJAM-FM in Windsor compared The Painted Ship with Iggy Pop. “Frustration” was part of a group of songs that rebelled against social pressures to conform, be controlled and limited by those in authority or even ones own peers. “Frustration” peaked at #7 in Vancouver and across the border in Bellingham, Washington, the song climbed to #6 on KPUG. In Salt Lake City “Frustration” made it to #5 on KNAK 1280-AM. “Frustration” also made the Top 30 in Trois Rivieres, Quebec, and San Bernardino, California. But that was about it for chart action in Canada and the USA. “Frustration” might not have even received any airplay. Without the knowledge of Bill Hay, other bandmates and London Records decided to make “Little White Lies” the A-side of the single and “Frustration” the B-side. However, “Little White Lies” didn’t make the local charts when the single was released. Instead, the moody “Frustration” began to climb the C-FUN charts and then up CKLG’s Boss 40 as well. The Painted Ship released one more single titled “And She Said Yes/Audience Reflections”. The single didn’t chart in Vancouver. “Audience Reflections (From Polyana’s Dreamworld)” was listed on the C-FUN ALL-CANADIAN TOP TEN, a song list that appeared below the printed C-FUN-TASTIC FIFTY. On that song list “Audience Reflections” peaked at #3 on May 13, 1967, with a chart run on the C-FUN ALL-CANADIAN TOP TEN of seven weeks. C-FUN was considered a great source of support to The Painted Ship and other local Vancouver bands. Bill Hay told Klemen Brenzikar of It’s Psychedelic Baby Mag in 2011 that “Audience Reflections” “was my attempt to capture the experience of a particular altered state of consciousness that I had experienced using quartz crystals as my refractory focus.” The song’s vocals were mostly obscured with high octave electric keyboard notes. Hay was told at the time by a local Vancouver DJ “that it might make the top 10 on Mars but it was way to weird for earth”. Hay hardly ever did drugs and regarded doing drugs as a form of imprisonment and an obstacle to freedom. The B-side of “Audience Reflections” was “And She Said Yes”. The song made the Top Ten at CJBQ-AM in Bellville, Ontario. The Painted Ship performed across British Columbia. Ken Putnam remembers the band played at his Burnaby Catholic high school St. Thomas Moore. Putnam recalls when he attended the dance “I had the word Frustration painted across the back of an old army jacket which was cool back then.” Another person posting about the band recalls The Painted Ship played by Lake Okanagan in Penticton in 1967. Hugh Martell recalls seeing them perform at a noon hour concert at the Hebb Lecture Theatre at the University of British Columbia. While they were part of the local scene in Vancouver, The Painted Ship opened concerts in Vancouver for The Yardbirds, The Grateful Dead, Jefferson Airplane, Janis Joplin, Country Joe & The Fish, Tom Northcott Trio and others. Bill Hay recalls The Painted Ship were playing at The Cave in Vancouver on July 17, 1967. Members of The Who and Herman’s Hermits showed up in the front row of the concert hall after their performance at The Agrodome. Before The Painted Ship finished their set members of both The Who and Herman’s Hermits joined The Painted Ship on stage for a live performance of the Rolling Stones‘ “Satisfaction”. After the evening, Bill Hay and John Entwistle of The Who kept in touch. One thing led to another, and Hay sent a producer at Polydor, who Entwistle had connected him with, a tapes from some sessions The Painted Ship did back in Vancouver. Hay was offered an opportunity to move to London, UK. However, he declined the offer as he didn’t want to break up The Painted Ship. While the master of the tapes was said to have been sent on to the Polydor offices in Chicago, it never materialized and was lost. The Painted Ship’s sound was considered too psychedelic a band to be commercial. Their record company pressured the band to record typical Top 40 singles. But Bill Hays vision of psychedelic and early punk rock didn’t catch on with numbers of other members of The Painted Ship. The band split up in 1968. The Rowden brothers, Robert and Barry went on to join a local Vancouver band called The Look. Bill Hay regards The Painted Ship as an example of the very earliest forms of punk rock. He doesn’t agree that The Painted Ship were a “garage” band. Hay states “To me, the garage sound has a more traditional element of R&B running through it. Our stuff does not. I say we are pure punk. I think the garage label is attached to us because some people think that punk didn’t exist when we played.” Hay went to a Polydor convention after the split. He was offered a job at Polydor, but he decided that promoting Top 40 AM radio singles wasn’t his path. He returned to Vancouver and mostly stayed outside the music industry. However, Bill Hay continued to write poems and lyrics for more songs. In the 2000’s Barry Rowden died after complications to his liver. Bill Hay has been available for a few interviews over the past decade making it possible to learn more about this ground breaking garage/psychedelic rock band that help shape the Vancouver music scene in the 60’s. Hay produced a few songs for the 1970’s UK punk band The Worst and sang some backing vocals. Klemen Breznikar, The Painted Ship Interview with Bill Hay, It’s Psychedelic Baby Mag.com, Prebold, Slovenia, July 12, 2011. Paddy Hanna-Ida, Song of the Day ~ The Painted Ship ~ And She Said Yes, The Listening Post Blog, March 2, 2018. C-FUN-TASTIC FIFTY, 1410 C-FUN-AM, Vancouver, BC, January 7, 1967. C-FUN ALL-CANADIAN TOP TEN, 1410 C-FUN-AM, Vancouver, BC, May 13, 1967. The Painted Ship Facebook page, Facebook.com. Samuel Taylor Coleridge, The Rime of the Ancient Mariner (text of 1834), Poetry Foundation.org. Dave, The Painted Ship Will Hay Interview & Show # 447, revrockblogspot.com, CJAM, Windsor, ON, March 12, 2013. Rick Hanson, Accept Them As They Are, Psychology Today, October 13, 2014.